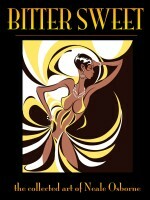 While ‘Sweet Art’ was the first collection of Neale Osborne’s black-and-white graphic work, and ‘Sour Puss’ its colorful cartoon counterpart - ‘Bitter Sweet’ features the best of both worlds, cherry-picking his choicest pieces and bringing both styles together in one full-color volume (and adding dozens of new images into the mix). Over the past twenty years, Neale’s distinctive illustrations have featured on posters, CDs, and dinnerware; in books, exhibitions, concert programs, and numerous periodicals. Collecting more than a hundred and fifty eclectic, stylish, expressive and decorative, sometimes provocative, ink-splattered designs, this generously-filled paperback (in a large 8.5” x 11” format) comes with pages of notes from the artist.